The History Panel (Choose Window→History) in Adobe Photoshop Creative Suite 6 is like a recipe that lists the steps that you took to cook up your image to its present state. By using the History panel, you can browse through the recipe and return to any step in the list to begin work from that point. States: States is just another way of saying steps. At any given point in your image-editing activities, Photoshop saves your edits into states. By default, Photoshop remembers 20 states for an image. You can increase the number to as many as 1,000 in the Performance Preferences dialog box. Choose Edit→Preferences→Performance (or Photoshop→Preferences→Performance on the Mac) and enter a new value (or move the slider) in the History States box. Boosting this number can eat up your available memory quite quickly. You may want to leave the states set to 20 and save snapshots of your image. When you reach the limit of 20 steps, the oldest step (at the top of the list) is deleted to make room for the latest one at the bottom. Snapshots: You can save temporary copies of an image at any state. This enables you to revert to a previous state any time during your work session by selecting a particular snapshot to work from. When you have these concepts down, you can get to the business of understanding how the tools in the History panel use states and snapshots to help you go back in time (and back to the future again) to undo, redo, and modify each miniscule edit you make to your images. Snapshot thumbnail: This miniature image of the saved snapshot image gives you a copy of your document that has all the current states included. 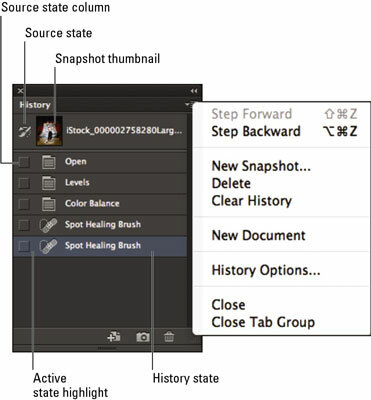 Source state column: Click in this column to the left of a particular snapshot or state, and when you begin painting with the History Brush tool or erasing with the Erase to History option, Photoshop uses the snapshot or state that you select in this column as the source. History state: A particular step or edit in your document’s list of steps. An icon appears in this column showing what kind of action occurred in that state. Active state marker: This slider points to the currently active state. You can drag it up or down to change the current state. Create new document from current state: Click this icon to create a duplicate copy of your image at the currently selected state. Your new document starts out with a nearly empty history list. The only state that’s present is Duplicate State. Create new snapshot: Click this icon to store an image of your document, preserving all the states listed. Delete current state: Click this icon to remove a selected state. Undone states: These gray states are undone when you select an earlier state in the list. Open state: The original document that you first opened. Current history state: The active state that you’ve selected in the history list.